Amal loves her school, her friends, and her family, including her younger sisters. After her mother has a new baby, Amal stays home from school for a few weeks to help out around the house. An accident at the local market leads to a terrible consequence - Amal must go and work for the unprincipled "landlord" of their small Pakistani village to pay off her family's debt. Her dreams of going to university and becoming a teacher are slipping away, unless she can find a way to free herself without endangering her family. This is a lovely book that reminds readers to appreciate the things they may take for granted, including the love of family, access to learning, safety, and freedom to make choices. 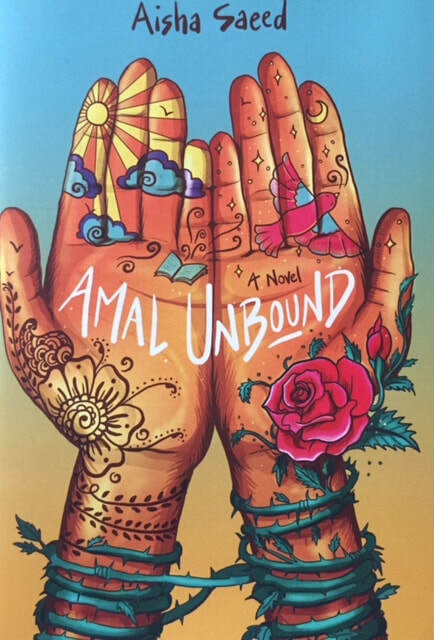 Amal has to negotiate many different relationships in this book and decide when she will help others, when she will forgive, and when she will fight for herself. The author's note references Malala Yousafzai's story and the struggle of many Pakistani girls who want to go to school and become trapped in situations like Amal's, although their stories aren't covered in the news. "Now I understood why Iqbal was Miss Sadia's favorite poet. It turned out he wasn't just a poet. He was also a politician, a teacher, a lawyer, a scholar, and a knight. I thought one dream was enough for a person, but reading his story, I learned some people could hold on to many different dreams and see them all come true."